A perfect 10. In the first inning! And eight of them came before an out was made! It was a horrendous start for the Mets and Steven Matz. Altogether, 14 batters, five hits (two of them 3-run home runs), and three errors by New York compiled the 10 runs in the bottom of the first as the Phillies, as you would expect, crushed the Mets 14-3. So even if the first inning never happened, the Phils still would’ve won the game. Everybody in the starting lineup except Aaron Altherr and Nick Pivetta (who struck out to give the Phils their first out in the first) got a hit. JT Realmuto and Scott Kingery, who started the game at third before moving to short after Jean Segura left, each got three hits and a home run for a total of five RBIs. Maikel Franco also added a three-run homer. As for the pitching, Nick Pivetta had a good outing, going five innings and giving up three runs off seven hits with two strikeouts and three walks. Nothing stunning but it’ll do. Jerad Eickhoff closed out the final four innings of the game and gave up only three hits and struck out six. That’s a great sight to see. Hopefully he can continue putting performances like that and maybe be a #6 starter if need be. The series concludes this afternoon at 1:05 PM on NBC Sports Philadelphia. Jake Arrieta takes to the mound to face Zack Wheeler. In other Phillies news, the 2026 MLB All-Star Week will be coming to Citizens Bank Park which will be great when we get to it in seven years. Can’t wait for something more than 2,600 days away! In what’s happening now, Bob writes on the recent struggles from Aaron Nola and Rhys Hoskins. And he also joined Anthony for a brand new episode of Crossed Up. 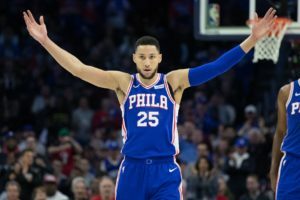 After a horrendous Game 1 with cellphone gate and Ben Simmons hating people that boo, the Sixers stormed back to dominate in the second half to take Game 2, 145-123. And with that, the series is now tied at one game each. Ben Simmons had an awful Game 1, but stormed back to make a huge impact in Game 2. Not only did he record a triple-double with 18 points, 12 assists, and 10 rebounds, but he made a much larger impact on the defensive side of the ball. Simmons knew he had to win the crowd back Monday night and did so. Joel Embiid had a double-double of 23 points and 10 boards, Tobias Harris woke up with 19 points, and JJ Redick scored 17. The Sixers finished 9-of-23 from 3 with Mike Scott going 3-of-5 and scoring 9 of his 15 from behind the arc. After leading by a point entering the half, the third quarter became a blowout. The defense forced Brooklyn with three turnovers and four misses to jump start a 21-2 run to blow the doors open. In the end, the Sixers scored 51 in the 12 minute span, a franchise record for points in a single playoff quarter. The 145 overall also set a franchise high. It comes to show what the ceiling could be for the club. A performance like this should take care of the Nets easily in the next three games. But it’s a marathon, not a sprint. Game 3 is Thursday night in Brooklyn and the Nets faithful will sure be ready for that one. I thought we would never see this again. For the first time since 2008, Tiger Woods won a major. And he won his first Masters since 2005 in a vintage Tiger performance. He didn’t do it in typical Tiger fashion, however. For the first time in his career, he won a major when trailing after 54 holes, beating out Francesco Molinari, Brooks Koepka, and others for the title. So many things to discuss. Whether it was Jim Nantz’s call along with the roar at Augusta when he sank the final putt, or his opponents hugging and congratulating him and his family at the end. But the most heartwarming moment as he walked off the course was a 43-year-old Tiger hugging his son Charlie. Similar to how he hugged his dad when he won his first green jacket in 1997. Golf is great again. Up next major wise is Bethpage Black for the PGA Championship in May. Stupid money. Spend it all. Shop now. After the bullpen blew a win on Tuesday, everything sucked. Nick Pivetta had his worst start of his three outings so far (and the other two weren’t that good either). The offense recorded one run (in the ninth on a damn ground out) on three hits (that all happened in the first six innings). Edubray Ramos sucked. The result: A 15-1 loss. It was so bad Aaron Altherr pitched (and clocked in at 90 mph but who cares). My goodness was it a load of crap. Is there anything really to discuss? One really awful game, but could it be the start of something longer? We’ll see; it’s a little too early to tell. Luckily the Phils are off today and have a weekend series in Miami against the Marlins. As for non-game stuff, Forbes ranked the Phils as the 9th most valuable franchise, and there’s a brand new episode of Crossed Up for your pleasure. With nothing to play for, the Sixers rolled out a depleted lineup in Dwyane Wade’s home finale, losing by 23 points in pretty sad fashion. It means they can finish no better than 51-31 with a win tonight, which would be one game worse than how they finished last season. It doesn’t mean anything in the big picture, not without context, but down the road we’ll look at this team and wonder why they didn’t win more games, because all three versions of this squad were arguably more talented than the group that ripped off 16 in a row in 2018 to finish 52-30. We will have to explain to our kids that the starting lineup only played ten games together down the stretch and that everybody had a severe case of looking ahead to the playoffs-itis.